As kids head back to school and routines begin again, it feels like summer is slipping away slowly. I'm hanging onto what's left so that means pool days, late-night patio chats, and fresh summer salads. 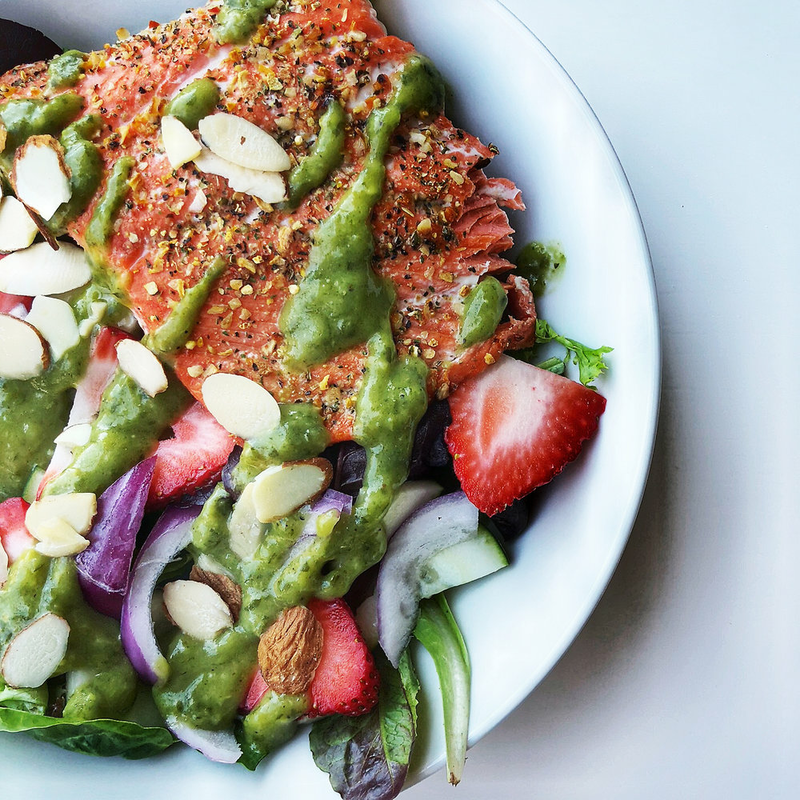 This salmon salad is one of my favorites! Its fully of essential omega-3 fats, rich flavors, and a fresh dressing. Wild caught salmon is full of vitamin B12 and B3, fat-soluble Vitamin D, selenium, and protein. It's worth the extra money for that deeper color and a balanced fatty acid ratio. Our bodies need both omega-3 and omega-6 fatty acids but the American diet is usually really low on omega-3 and really high on omega-6 fatty acids that are damaged, oxidized, and highly processed (ahem, bleached and deodorized!) such as hydrogenated oils and industrial seeds oils like canola and vegetables. When we have too much omega-6 and not enough omega-3, inflammation can wreak havoc. So where do you buy wild caught salmon? If you're on the coast, fresh fish markets should carry it. If you're like me and landlocked, I buy wild caught salmon from Costco! They come in individual serving packs which makes lunch a total breeze! Add it to your eggs, serve it with cauliflower rice and seaweed salad, or put it on your salad like I do! Here's how I make my salmon salad! To make the dressing, combine all ingredients in a blender and blend until smooth. If you need, add filtered water until it can easily be poured. Enjoy! As always, if you make this, tag me on Instagram (@_lemoandfig) so I can fangirl over your creation!